Other Products by Inner Armour. Search other Protein Powder products. Inner Armour Super QUAD Protein is a scientifically advanced blend of Micro-filtered Whey Isolste, Utra Pure Whey Concentrates, Micellar Casein and Milk Protein Isolate which provides a mult-stage extended release protein matix designed to optimise protein uptake. The sustained-release matrix in Inner Armour Super QUAD also contains branched chain amino acids and creatine to provide you with the building-blocks you need to achieve rock-hard muscle. Inner Armour Super QUAD extended-release matrix works long and hard to deliver premium quality protein to assist lean mass gains and maintenance and repair of muscle tissue. Mix 1 scoop with 150-180ml of cold water. 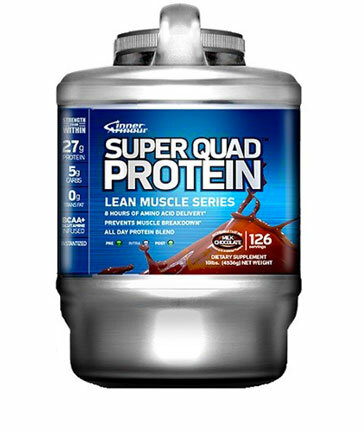 For best results use Super QUAD immediately post-workout as well as 2-3 times daily as a protein supplement. Absolutely astounding product! I have this protein and it is one very good protein. Very large scoop, but then again, very large quality too! Mixed with Animo Acids, Creatine & 35g protein per serving - This is a great morning, post-workout and before bed protein! 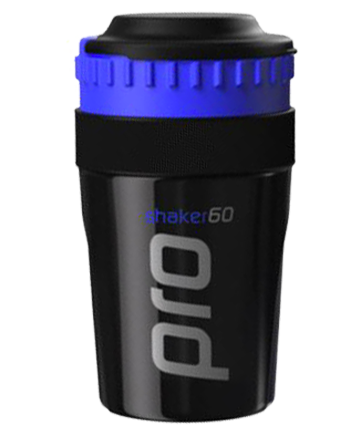 It is a mixture of Whey Protein Isolate (fast burning protein) for post workouts & Whey Protein Concentrate (Slower burning protein) suitable for bed time - as it will keep the metabolism going while the protein is digested. Flavour wise - It is very very thick even with plenty of water. I prefer thinner, more watery proteins. I have the Cookies & Cream flavour and it's average, I would prefer to swap it for Chocolate or Strawberry, or even Vanilla. All in all, a highly beneficial product that I recommend to anyone. Big 4kg bag last for 124 servings I believe! Ingredients: Ultra Pure Extended RElease Whey Protein Blend (Ultra Filtered Whey Protein Concentrate, Micro-filtered Whey Protein Isolate, Micellar Casein, Milk Protein Isolate) (86%), Maltodextrin, Flavour (Cocoa Powder), Natural and Artificial Flaovurs, Amino Acid (L-Glutamine, L-Leucine, L-Isoleucine, L-Valine), Thickener (Xanthan Gum, Carrageenan Gum, Cellulose Gum), Taurine, Sweetener (Acesulfame Potassium, Sucralose), Flavour Enhancer (Salt).